Are an employer in Montana, North Dakota or Wyoming or you are a prospective employee with a TN visa question? If so, you can read more about it here. If you know you need help, please contact us. The North American Free Trade Agreement that came into effect on January 1, 1989 made the TN possible. 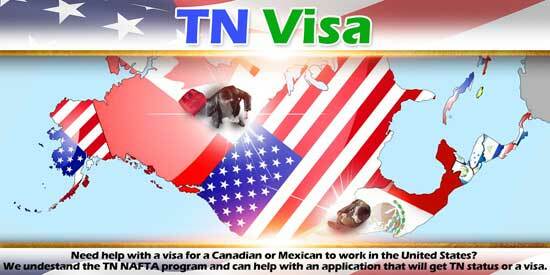 NAFTA changed the B-1 visa, L-1 intracompany transferees, E traders and investors, and created the professional TN visa (trade NAFTA). Accordingly, this article is an overview of the TN visa requirements. With its focus on professional employment, the TN visa is often compared to the H-1B visa. This is no accident. The 63 categories of professionals authorized in the NAFTA legislation was actually a list of professions recognized by the USCIS for the H-1B in 1989 at the time of the NAFTA legislation. USCIS has expanded the list of professions for which it permits H-1B status. Unfortunately, the list of NAFTA professions for the TN visa has not changed. Occupations authorized for TN status include computer systems analysts, scientists, architects, engineers, economists, lawyers, and librarians. TN visa applications in these categories are rarely controversial. If you have a degree in any of these fields, have a license if appropriate, and have a job offer from a US employer, application at the border will usually get you TN status. Unlike the H-1B visa, you may not show that you have the equivalent of the bachelors degree to meet the bachelors degree requirement. Also, like the H-1B visa, the TN requires an employer and does not allow self-employment. In my 20 years of practicing as an immigration attorney, I have heard stories of Canadians purchasing an entity in the United States, and using the entity to create the required employment documents. If Customs and Border Protection (CBP discovers this ruse, it is likely that CBP will give the TN applicant an expedited removal order. From an immigration perspective, the applicant’s use of a US entity that the Canadian or Mexican controls is no different than straight self-employment. In contrast to the uncontroversial TN categories discussed above, three categories are controversial: management consultants, computer system analysts and scientific technician/technologists. As there is some debate over exactly who qualifies to fill these categories, CBP often sees applications that are a clumsy and inelegant attempt to shoehorn someone into one of them. CBP denies these applications. After CBP denies the applicant, it is often difficult for the applicant to receive CBP approval. Obviously, it is easier to do it right the first time. We have succeeded in petitioning CBP for these difficult TN visa positions. Once you have the TN, its period of validity will usually have matched the period requested by the employer. If the employment continues for more than the initial period, the holder can renew the TN visa. Sometimes it is easy to go to the border again with a new letter from your employer. If a visit to the border is not an option, the you may renew your TN visa status by filing an application to extend your status with the USCIS. We can help with the preparation of the necessary employer offer letter. If you need advice about TN visa status, we can help with that too. Lastly, if you know your TN is in one of the three difficult categories discussed above, we can offer a consultation to evaluate your chance of success, and prepare the application as well. Please contact us. Immigration Law of Montana, P.C.